Learning to be outgoing, proactive and social can be hard for introverted or shy people. But, as everything can be learned, you can also overcome your social phobia and develop an outgoing, friendly personality. 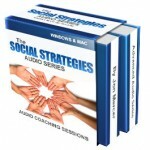 Social strategies is a program developed by Jon Mercer (author of the Easy calm program), which promises to help you in your endeavors of improving your social skills. We talked about Jon Mercer in the previous post, so check it out if you want to find out more about Jon. The root of social anxiety can be found in our thinking habits. So the only real way to overcome your anxiety is to improve your habits. Taking full responsibility for your condition is the first step which empowers you to change your situation. Social strategies course is consisted of 8 audio lessons and the interesting thing about it is that those lessons are actually different strategies or games you could use to your benefit when you find yourself in different social situation. mind to react in a specific way, whenever you find yourself in some social surrounding. Those 8 strategies are the best or most effective mental games Jon compiled from his experience in helping many people make drastic changes in their lives – overcome extreme shyness or social phobia. It may seem strange that playing ‘games’ could help you in such serious conditions. But, as author discuss this matter, taking lighthearted path always works better with social phobia and shyness. Working hard and struggling to make a change in your behavior isn’t the answer. If that kind of approach didn’t help you so far, you might wanna try Jon’s Social Strategies and see for yourself how effective they really are. As with all products being sold through clickbank, this course also offers a 8 week unconditional guarantee.